The World Tree rises up out of the seething clouds like a green mountain. All creation nestles in its green branches. There is no world besides this one ... or so the people believe. Tymon grows up at Argos seminary in the lush heart of the Central Canopy, where science is a heretical pursuit and travel beyond the Tree is banned. But he yearns to break free of these rules and discover new horizons. When he meets a despised Nurian slave in the city baths, his dreams of freedomtake on a completely different meaning. 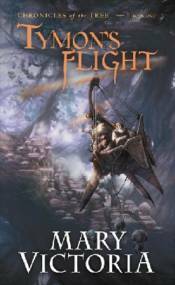 Banished to a drought-ridden colony, Tymon falls in with a group of Nurian rebels and finds himself facing difficult choices. Fighting for freedom and power is not so enticing when it may mean betraying his own people and severing all ties to the world he knows.